The Modern Jazz Quartet (MJQ) was a jazz combo established in 1952 that played music influenced by classical, cool jazz, blues and bebop. The band performed over a 40-year span with only one personnel change. For the majority of their career the group comprised John Lewis (piano and musical director), Milt Jackson (vibraphone), Percy Heath (double bass) and Connie Kay (drums). Under Lewis's leadership they carved their own niche by specializing in elegant, restrained music that used sophisticated counterpoint yet nonetheless retained a strong blues feel. Lewis firmly believed that J.S. Bach and the blues were compatible, combining classical form with jazz improvisation and polyphony. The band was also noted for its ability to play alongside a variety of other groups. Initially active into the 1970s until Jackson quit due to creative disagreement and frustration with their busy touring schedule in 1974, the MJQ reformed intermittently into the 1990s. In 1946, John Lewis (piano), Milt Jackson (vibraphone), Ray Brown (bass) and Kenny Clarke (drums), all members of Dizzy Gillespie's big band, formed a quartet as a side project. By 1951, the combo were recording as the Milt Jackson Quartet. In 1952, Percy Heath replaced Brown on bass and in late 1952 they changed the name to Modern Jazz Quartet. In 1955, the final switch to the band's lineup occurred as Connie Kay (drums) replaced Clarke. In their middle years the group often played with classical musicians, but their repertoire consisted mainly of bebop and swing era standards. From 1952 to 1955 the group recorded for Prestige and released two of their most famous compositions, "Django" (a tribute to the guitarist Django Reinhardt) and "Bags' Groove" ("Bags" being Jackson’s nickname). In the late 1950s they provided soundtrack music for Roger Vadim's film Sait-on Jamais (released in America as No Sun in Venice and in the UK as One Never Knows) and subsequently recorded this music. From 1956 to 1974 they recorded for Atlantic Records, with occasional projects with other record labels such as Apple. In 1974 Jackson departed from the group and they ceased to play until the early 1980s when they began reuniting periodically. The MJQ released their final recording in 1993. When Kay died in November 1994 the group stopped reuniting; five years later in October 1999 Milt Jackson died, followed by John Lewis in March 2001 and Percy Heath in April 2005. The paradox of the MJQ's music-making was that each individual member could improvise with an exciting vibrancy while maintaining the precision and collectedness of a classical group. They typified cool jazz through John Lewis' composition skills, but also exemplify bop with Jackson's virtuosic improvisation. As musical director, Lewis envisioned a style that fused composition and improvisation. Lewis wrote both “fugue-like” classically influenced pieces as well as modern jazz standards such as "Django". The Modern Jazz Quartet played in a variety of styles, but generally played a combination of cool jazz and bop. Jackson brought a strong bebop influence to the group with his virtuosic improvisation and was the first to play vibraphone in a bop style. Percy Heath too brought a hard-bop influence to the group having played with J.J. Johnson, Art Blakey, Thelonious Monk and Clifford Brown. The MJQ’s style was characterized by flexibility; they played alongside orchestras and brass bands, covered a Beatles tune and performed at prestigious venues. 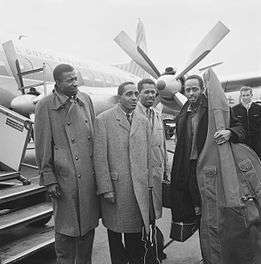 The Modern Jazz Quartet earned a variety of honors including the first NAACP award for cultural contributions in the field of music in 1957 to top billing on numerous jazz magazine polls to honorary doctorates from Berklee College. 1 2 3 4 Scott Yanow, "The Modern Jazz Quartet", AllMusic, accessed April 21, 2014. 1 2 Giddins, Gary, and Scott Knowles DeVeaux. Jazz. New York: W.W. Norton, 2009. 1 2 Wolfram Knauer, "Modern Jazz Quartet, The", Grove Music Online. Oxford Music Online. Oxford University Press, accessed April 21, 2014. 1 2 3 Bordowitz, Hank. 1992. "MJQ celebrates 40 years." American Visions 7, no. 1: 26. Academic Search Complete, EBSCOhost (accessed April 21, 2014). 1 2 3 Paul Finkelman. Encyclopedia of African American History, 1896 to the Present: From the Age of Segregation to the Twenty-First Century. New York: Oxford University Press, 2009. Accessed April 21, 2014. ↑ Wolfram Knauer. "Lewis, John", Grove Music Online. Oxford Music Online. Oxford University Press, accessed April 22, 2014. 1 2 Thomas Owens. "Jackson, Milt", Grove Music Online. Oxford Music Online. Oxford University Press, accessed April 22, 2014.